Bus from Kuala Lumpur to Pasir Mas is the preferred choice of transport to connect a big city with a small town in Kelantan. This bus service serves as an important public transportation for locals. This is especially for those who are working and studying in Kuala Lumpur but whose hometowns are in Pasir Mas. They usually go back to their hometown during off days or holidays. 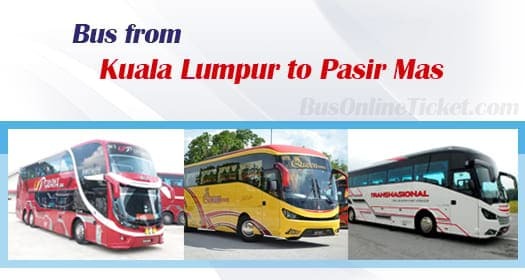 Adik Beradik Express, Perdana Express, Queen Express dan Transnasional are a few bus companies offering bus services from Kuala Lumpur to Pasir Mas. Among all the bus operators, Perdana Express is the largest player in this route service by providing 7 departures daily. Their combined trips have in total 12 daily departures. Please note that there is no bus available during afternoon session. Both Perdana Express and Queen Express deploy Double Deck Coaches to serve passengers while Transnasional and Adik Beradik are serving the passengers with Single Deck Coaches. However, both coach types are installed with spacious VIP seats. The travelling time from Kuala Lumpur to Pasir Mas takes about 9 hours depending on the traffic situation. A washroom break will be given during the journey. Additional breaks will be given upon request to the bus driver. The ticket price for bus from Kuala Lumpur to Pasir Mas is in a range of RM 47.00 to RM 48.00. The boarding point in Kuala Lumpur is located at the main transportation hub in Kuala Lumpur, which is known as Terminal Bersepadu Selatan (TBS). Booking a ticket for bus from Kuala Lumpur to Pasir Mas at BusOnlineTicket.com is easy, reliable, and convenient. You can avoid the hassle of travelling to the ticketing counter to buy tickets. With our 24/7 online booking service, you can now book your bus ticket from Kuala Lumpur to Pasir Mas anytime, anywhere and any place.